Apart from a slight increase in the public’s esteem for NPR and the National Enquirer, the credibility of the American media has plunged broadly and steadily since 1998, according to an unsettling new report. Perhaps most troubling is that the public’s regard for local newspaper and TV coverage has fallen the farthest in a survey by the Pew Research Center for the People and the Press. As you can see from the table below, cable TV news was the most trusted news medium when Pew conducted its first media credibility poll in 1998. Cable TV news was rated as believable by 37% of the respondents eight years ago vs. 24.8% today. 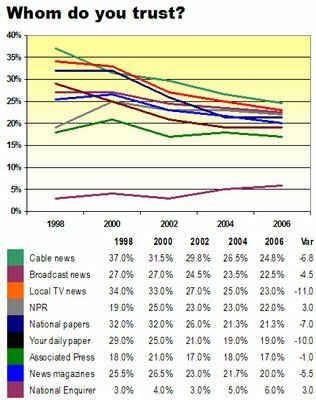 In the same period, local TV news fell from 34% to 23% and the daily paper tumbled from 29% to 19%. Against the average credibility drop of 4.4 points for all the media surveyed by Pew, the plunge for local TV was 11 points (2.5x the average) and the tumble for newspapers was 10 points (2.3x the average). This has huge implications for the local media franchises fighting for audience, ad share and profitability in a time of technology-induced disintermediation. Even as local media seek to consolidate their core audiences and build their presence in the digital realm, they find themselves battling the growing perception that their primary competitive strength – their expensively-produced content – is not perceived by viewers and readers as being as valuable as it used to be. Ongoing newsroom layoffs are unlikely to help reverse this trend, and, arguably, may accelerate it. In fairness, however, the damage to media credibility probably is less self-inflicted and more the result of an increasingly cynical political process. It is encouraging that NPR is one of the two surveyed media whose credibility actually has increased in the last eight years. Public radio today is deemed as being trustworthy by 22% of respondents vs. 19% in 1998. Before we get too carried away, remember that the only other winner is the National Enquirer. Its confidence has doubled to 6% in the last eight years. It’s nice to know there are a growing number of inquiring minds out there. The Thomson Financial news service has developed a computer program that, it is said, can write a passable news story in three-tenths of a second. That’s not bad. But Thomson could have boosted productivity even more if it had lured Phillip J. O’Connor out of retirement. Lean, bespectacled, soft-spoken and manifestly unassuming, Phil O’Connor was the fastest, cleanest rewrite man in Chicago, a town filled with great and legendary newspaper folk. He retired from the Sun-Times in 1997. Phil’s long, slender, swift-moving fingers crafted beautifully written, factually correct stories as fast as they unfolded. He was so quick that his desk was equipped with two computer terminals to keep up with him. Phil had an uncanny sense of not only what the story was but also where it was going. He wrote articles in real time while unloading the legman or woman on the other end of the phone. As soon as he hung up, Phil began dialing into his vast network of sources to fill holes, solicit reaction and advance the story ahead of the competition. Keeping a watchful eye on the city desk, Phil could tell when I, the city editor, had a new story on deadline with no free reporter to write it. Madly typing away, Phil would nod his head slightly to let me know he soon would be ready for the next assignment. He was a sweetheart of a rewrite man. And he never needed to be rebooted. I don’t know if the New AOL will fare any better than the New Coke, but you have to give Time Warner credit for the guts and objectivity to turn its doddering dot-com into the oldest, fattest start-up you ever saw. AOL’s bold, if tardy, move is a major lesson for the traditional media companies, which continue to be strategically inattentive to the profound changes affecting the way people get and, increasingly give, news, information and entertainment. Change at the Old Guard media companies remains grudging, glacial and glaringly incremental, because innovation runs against the grain of their conservative, tradition-bound and extensively defensive cultures. The general lack of entrepreneurial instinct among the media incumbents is no benign quirk. It could prove to be their undoing in an era when rapid-fire technological developments are driving radical changes in the delivery of all media. The relentless changes will restructure the economics of every business from movies to newspapers and radio broadcasting to book publishing. The Old Guard companies need to get cracking, if they mean to save themselves. With competing technology and new media alternatives gaining rapidly on once-secure realms, the half-lives of the legacy franchises are deteriorating at a quickening pace. While they dither, the time to fix them is shrinking exponentially. Knight Ridder, one canary in the coalmine, was sold earlier this year for approximately 9.5x its profits vs. the 13.5x that the Pulitzer newspaper chain fetched a year ago. Had KRI sold for the same multiple as Lee, its shareholders would have gotten 30% more than they pocketed. In the magazine world, some analysts now think Ziff-Davis may be sold for less than half the $789 million its owners paid in 2000. Big markdowns have yet to come for TV broadcasters. But they likely are on the way, owing to the proliferation of broadband connectivity; the growing availability of online video, and the pending emergence of home entertainment systems capable of magically transporting digitized content from your computer to the JumboTron in the living room. Because AOL was a technology-dependent media company – or is it the other way around? – an abrupt technological disruption devoured its business much faster than tech-driven changes have affected most traditional print and broadcast companies. As happens just about every day in the technology industry – even big names like Netscape, Silicon Graphics, Xerox, IBM, DEC, Intel, Sun and Cisco are not immune – a major advance in technology blows up someone’s business. At AOL, the dial-up business that made the company wealthy and powerful enough to buy Time Warner five years ago was destroyed in a like number of years by faster, cheaper and better ways to connect to the Internet. Faster: DSL is 25x quicker than a dial-up connection and a cable modem is faster than that. Better: DSL and cable don’t tie up your phone line and are always on, or supposed to be. Cheaper: Wireless DSL in some markets is half the $27 that AOL was charging for its slower, less convenient dial-up service. Facing an inexorable and accelerating decline in subscribers, AOL had no choice but to substantially abandon its $8 billion dial-up business in hopes of morphing itself into an advertising-supported web destination akin to Yahoo, Google or the Xbox360 blog. Unlike the New AOL, whose mandate for change was forced vigorously upon it, the Old Guard media companies are suffering from a more subtle, but equally insidious, form of creeping market disintermediation. Accordingly, they have been slow to grasp the need for change and even slower to embrace it. Ziff-Davis for a time did so well at publishing technology magazines that it didn’t see its readers were the people who were going to migrate firstest and fastest to the digital media. The company failed to create the online products its customers and advertisers wanted. Plenty of low-overhead interlopers happily took up the slack. Publishers have drastically cut headcount in their newsrooms to slightly improve profitability, cannibalizing the very departments that create the valuable content that distinguishes them from their computer-authored digital competitors. Some TV stations have gone so far as to eliminate newscasts entirely – oddly forsaking a major point of differentiation at the moment their once-exclusive programs will soon be spread willy-nilly over the Internet at prices ranging from $2 to free. When big media companies try something that, by their lights, is relatively radical, they do so in half-measures. Even though most investors have been getting stock prices off the Internet for a decade, it was only this year that many newspapers finally decided to stop publishing four expensive pages of agate listings per day. Had publishers recognized the change in consumer behavior 9½ years ago, they could have been the ones generating the page views and ad revenues that today go to Yahoo Finance and Market Watch. Instead of having the good sense to start MarketWatch itself, Dow Jones waited until 2005 to buy the company for a half-billion dollars. A year later, the Wall Street Journal continues to publish more pages of stock listings than anyone else. Because disintermediation is nibbling at their long-standing franchises in comparatively slow motion, most legacy media companies fortunately have the time and remaining resources to turn their desultory bureaucracies into nimble entrepreneurial juggernauts. To do so, however, they need to make some fundamental changes. First, they need to objectively assess and understand the needs of their customers – including the ones they have, the ones they want and, most significantly, the ones they have lost. Next, they need to turn those insights into innovative products or services that can be tested empirically with the intended audience and advertisers. Companies must be willing to break the rules, topple bureaucratic fiefdoms and, yes, to selectively and carefully open holes in the Chinese walls that separate newsrooms from the business side of the business. Although the firewall-side chats ought to result in new ways to comfortably package editorial and advertising information, this most certainly is not an argument for publishing the cheesy advertorials that erode an organization’s hard-won credibility. Last but not least, media companies must summon the financial and emotional courage to take the carefully calculated risks required to bring their innovations to market. This will be particularly challenging for public companies, which must satisfy investors by endeavoring to create consistent and predictable quarterly earnings growth. If the publicly held media companies are to succeed, they will need to seek the support, or at least the forbearance, of Wall Street for a period of thoughtful strategic rebuilding. Given the dismal performance of most media stocks during the last 18 months of extreme retrenchment, it seems clear that investors aren’t happy, anyway. Why not try something positive? Though entrepreneurial innovation is easy to discuss in the abstract, it is quite another thing for individuals and institutions to internalize a radically new way of doing business. They need to get over it. And get on with it. The Old Guard companies must understand that the battle is no longer Oprah vs. Martha, the N.Y. Times vs. the L.A. Times or CBS vs. CNN. Rather than competing among themselves according to the ancient rules of genteel engagement, the legacy companies need to recognize that the true competitors in the future will be not only the upstart digital start-ups they know but also the ones that have yet to emerge. For all the legendary excesses and goofiness of Silicon Valley and its global cousins, the new competitors share a powerful culture that disdains entrenched market leaders, embraces risk and dares to fail. They are, in short, engaging the Old Guard in asymmetrical warfare with decidedly alien weapons and attitudes. The only way the Old Guard can lick them is to learn how to think – and act – like its competitors. En garde! 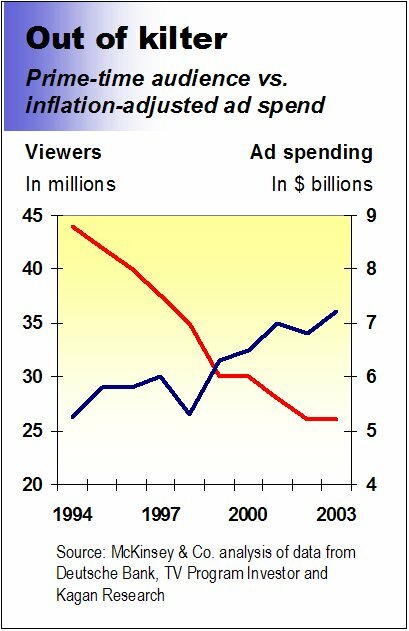 The costs and benefits of television advertising are out of whack and getting worse, according to a new analysis from McKinsey & Co. In an unsettling prognostication for marketers, broadcasters and their collective shareholders, the consultants reckon that TV advertising will be 35% as effective for some advertisers in 2010 as it was in 1990. Inflation-adjusted ad spending on prime-time broadcast TV has increased about 37% over the last decade, while the number of viewers has dropped by 41%, according to the McKinsey analysis depicted at left. “What’s wrong with this picture?” the consultants asked rhetorically in a white paper the firm is sharing with its blue-chip clients. Taken to its logical conclusion, the escalating inefficiency in television advertising suggests that marketers will shift a growing proportion of their budgets to the digital media that are the reason their once-loyal audience is tuning out. At the same time broadcasters have been cranking ad rates, McKinsey notes, viewers have been migrating to everything from the Internet to games to DVDs to iPods to homegrown video. But we knew that. The truly startling factoid in the research is that teenagers say they spend nine-tenths of an hour per day reading a book or magazine vs. a mere 30 minutes for the rest of us. Parents shouldn't don’t get too excited about this. Half of the kids report that they are reading while listening to music, watching TV, talking on the phone, listening to the radio or some combination of the above. Beyond battling the media clutter that’s fragmenting their audience and rocking their world, TV execs also must contend with the impact of TiVo, which famously permits viewers to zap around commercials, and the looming on-demand delivery of online video. Of all the threats to the traditional broadcasting model, I would argue that video on demand, which remains in its infancy, is the greatest. All the broadcast and some of the cable networks are experimenting with offering their prime fare online for somewhere between $2 and free (in conjunction with pre-roll advertising). If the nets like the results – and what’s not to like? – they energetically will circulate ever more of their programming throughout the web, keeping the resulting revenues for themselves. As soon as enough video-enabled cell phones are in the hands of consumers (industry gurus say it will take a couple more years), VOD will go mobile, too. This gain for the networks would be a big loss for their local affiliates. The continuing disintermediation of audience and revenues will carve into the monopolies that historically ensured the great and growing value of local TV franchises. Here’s one idea for the affiliates, courtesy of McKinsey: As advertisers look for cost-effective ways to connect with customers, they will want to spend $1.4 billion to $3.2 billion for online video advertising by 2007. Today, there is only about $600 million worth of online video inventory to sell. Anyone want to harvest some low-hanging fruit? Why is Josh Wolf in jail? Josh Wolf, the San Francisco blogger jailed for refusing to give a federal grand jury the video outtakes of a demonstration, likely would be free today if his case had come before a state court. That’s because California law, as tested and affirmed, explicitly grants journalists the right to withhold unpublished material from prosecutors. So, why is Josh in jail? Because it’s a federal case, and federal law provides no equivalent protection to reporters who seek to shield their confidential sources and unpublished information from being used as investigative fodder by prosecutors. That explains why the 24-year-old, self-styled chronicler of leftist politics was put behind bars, where he potentially could stay until next summer. But it doesn’t explain why this case is a federal case. Or why the feds are pursuing it so vigorously. What we do know is that Josh is being held for contempt of court because he refused to give the feds the unpublished portions of video he took at an anarchist street demonstration in San Francisco in July, 2005. In the seemingly pointless melee, a police officer unfortunately “suffered a fractured skull in a confrontation with a splinter group of marchers; several store windows were broken, and someone allegedly tried to set a police car on fire by sliding a mattress underneath and setting it ablaze,” according to the San Francisco Chronicle. But what makes this comparatively prosaic civil disturbance a federal case? And why have federal prosecutors for the last six months been aggressively pursuing Josh, whose role, from all known evidence, appears to have been no greater than that of an anarchist groupie passively wielding a Camcorder? Unless there is more to this case than meets the eye – if so, what is it? – I can't understand why Josh is in jail.